There is a very common misconception that home-schooled children face a more difficult transition to college in comparison to their peers who attended public or private school. Research reveals that home-schooled children seem to handle the transition very well and can adjust to their new learning environment without as much difficulty as once thought. More than 2 million U.S. students in grades K-12 were home-schooled in 2010, which accounted for roughly 4 percent of all school-aged children, according to the National Home Education Research Institute. A fascinating study produced by Michael Cogan of the University of St. Thomas found that home-schooled children actually graduate at a higher rate than their peers – 66.7 percent compared 57.5 percent. Home-schooled children also earned a higher grade point average than their college peers. Many will argue that home-schooled children are not as well socialized than their peers who attended public or private high schools. However, this assertion can be refuted on the basis that home-schooled children often play on athletic teams and participate in volunteering activities that expose them to individuals from all walks of life. 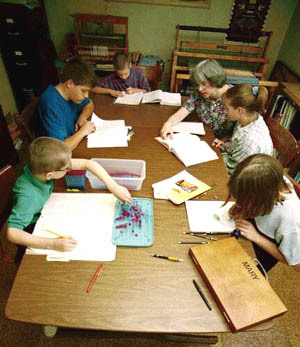 While public and private school students mostly interact with other students of the same age, home-schooled children interact with students and even adults of various ages. This can really help foster and develop socialization skills. In any case, making the transition to college can be difficult for any student. Let’s take a look at some steps you can take to help ensure that your home-schooled child’s transition to college is as seamless as possible. Home-schooled children do not have the same access to a guidance counselor who can help guide them through the college admissions and application process. This is why you must play the role of guidance counselor. You should start talking to your child about college well ahead of time to get him or her in the proper mindset. Ask your child which colleges he or should may want to attend and what majors seem interesting. You can contact admissions counselors at colleges to better understand course requirements and extracurricular activities that are offered. You can also easily research scholarship and financial aid opportunities online. It is important for all students to visit campuses of colleges they are interested in ahead of time of their enrollment. The quality of the campus atmosphere can be a decisive factor in your child’s decision of whether or not to enroll in a particular college. A campus visit also allows you and your child to visit college counselors and enrolled students so you can ask any questions you may have. It’s also an excellent idea to have your child sit in on a live college lecture. It can really be a shock for new students to learn just how large a college lecture hall can be. Your home-schooled child can get a taste of academic life in college by sitting in on a lecture. Most college campuses are packed with students who come from all walks of life. There is tremendous racial, cultural and religious diversity on campuses. If your child has been sheltered in a very comfortable home-schooled environment, it can be difficult to make this transition. To prepare your child, you may want to encourage him or her to volunteer at homeless shelters or other places the summer before college. This will give your child the opportunity to step out of a comfort zone and interact in a meaningful way with a variety of people. Your home-schooled child may not have had the same opportunities to participate in extracurricular activities as their public and private school peers. You should encourage your child to really take a look at the extracurriculars offered by prospective colleges. Your child can participate in activities that may help expand on classroom lectures. If your child wants to major in math, for example, you could encourage him or her to participate in math competitions. If your child wants to major in communication, participation in speech team could be an excellent choice. If you have a child who is preparing to make the transition from a home-schooled environment to college, it’s time for you to get active and devote real time and effort to the process. Beth Myers is a proud wife and mother of two home-schooled boys, web content coordinator for BabyChangingStation.com. Beth’s two boys will be attending college next year and she is preparing them for the process.